Taste test: The overall problem is that these don't taste a whole lot different from regular Party Mix, but the bag says they are "zesty", which is a blatant exaggeration. Tortilla chip: Kind of like a Dorito but not as good. Corn chip: Regular corn chip taste. Cheese curl: Like a Cheeto but not as pure. There are other flavors mixed in. Some of them are a decent size, though. Pretzel: Just a pretzel. Smell test: Smells like a big bag of corn chips, but not as good as Fritos. Not very zesty. Company: Keystone Food Products, Inc. 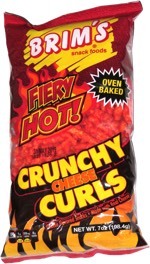 This snack was discovered by Jeremy at Lincoln Discount, Framingham, Massachusetts.